In 10-inch nonstick skillet, heat oil over medium-high heat. Add onion; cook 8 to 10 minutes, stirring frequently, until soft and golden brown. Reduce heat to medium. Stir in vinegar and seasoning blend; cook 3 to 6 minutes, stirring frequently, until liquid is absorbed. Remove from heat. Meanwhile, heat oven to 375°F. Unroll pie crust on ungreased nonstick cookie sheet. Lightly brush mustard over crust. Sprinkle 2/3 cup of the cheese over center of crust to within 1 1/4 inches of edge of crust. 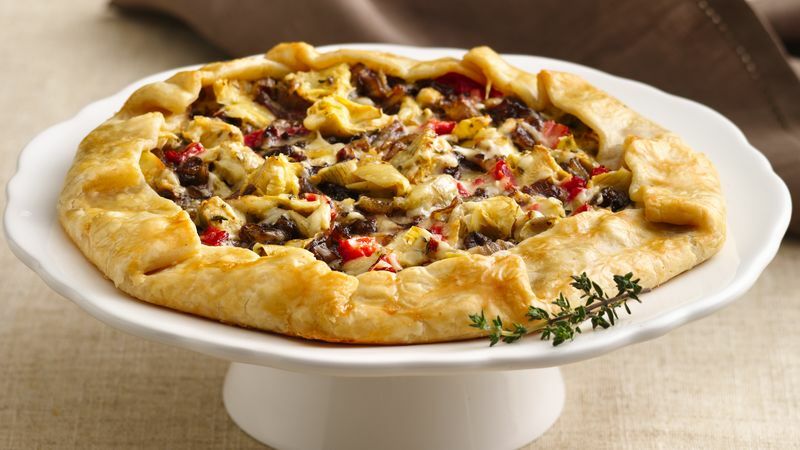 Spread onion evenly over cheese; top with artichokes and red peppers. Sprinkle with red pepper flakes, 1 teaspoon chopped thyme and remaining 1/3 cup cheese. Fold 1 1/4-inch edge of crust over filling, pleating crust as necessary. Brush egg white over crust edge. Bake 20 to 25 minutes or until crust is golden brown. Cool 15 minutes. To serve, cut into 8 wedges. Garnish with thyme sprigs. Serve warm.